Last Saturday Rob put the children to bed for me so I could sew a little. I made up 2 simple little dresses. I like this type of sewing because I don't need to spend any time on making a pattern. The dresses are so simple. No pattern drafting or trial runs ever needed. Only thing I do is check length to make sure I have long enough dresses (if they look short I just add another ruffle). I make simple little tops short sleeve, long sleeve, and no sleeve (along with long sleeve and no sleeve dresses)all in this same way. All I do is changing the length of the pieces a bit. I do this type of thing whenever I am longing to do some sewing but am short on time. 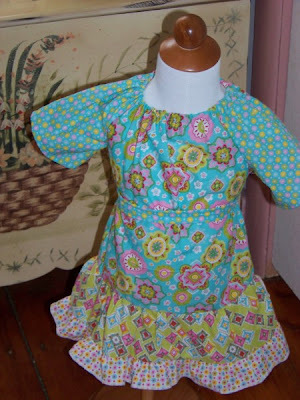 I made both dresses out of some fat quarters. 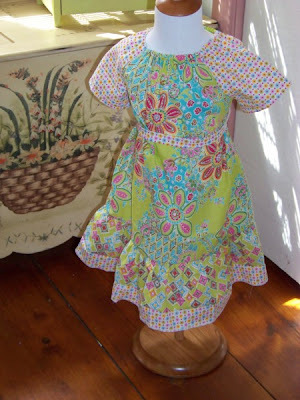 This first dress (pictured above) is one I made for Demi (my 3 year old). I made it a simple A-line style dress. I like the shape a little better on this dress than the shape of the second dress. This is the dress I made for Zee (my 18 month old). It is not an A-line. It is just a straight dress with 2 ruffles on the bottom. I like the colors on this dress a little more than the colors in Demi's dress. Over all I like them both. It was so nice of my hubby to give me the time to sew without children pulling at my leg. This quick and easy patternless stye I use a lot to make both of my girls tops and dresses. I feel it always turns out nice (very nice when I consider the tiny amounts of fabric and time needed to make them). For Demi's dress all I did was take the normal width I use to sew her a top. I used that measurement for the top of the fat quarter (area around neck and chest) and angle it down to the width of a fat quarter (did same for front and back). I then took 3 widths of fat quarters (I think they are 1/2 lengths of fat quarters to make the ruffle). Bottom layer was the same width as the ruffle above but 1/2 the length. Added a belt so it doesn't look like PJ's. Zee's dress was just a rectangle cut the width of her normal tops (woven not knit). The first ruffle is 2 wide strips both the width of a fat quarter. Bottom ruffle was 3 thin strips all the width of a fat quarter. I still need to make each dress a flower (probably a yo yo style flower with a belt loop back) to put on the front of each belt so they can wear them to church tomorrow morning. I want to hide the seam on front of belts so the ties can stay in back of dresses. I like the look of the ties in back better than in the front.